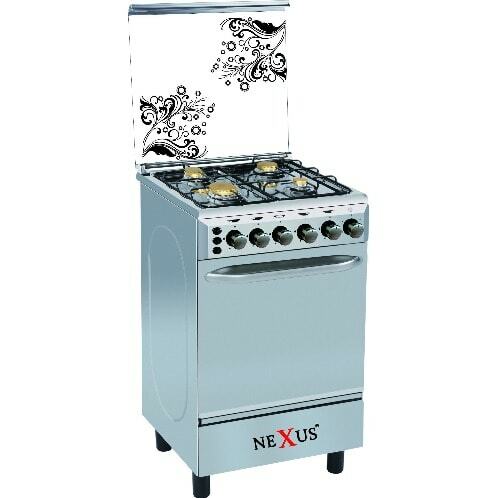 Nexus Gas Cooker is built and designed to make preparation of various meals an easy tasks. It offers you bluish flame that gets food prepared so quickly and the efficiency from it is so astounding. Connect to a gas cylinder which makes it function to give you better performance. It has three gas burners that allows you multi-task and makes cooking faster and an electric hot plate that is convenient to handle via the control button. The cooker is switched on to give you bluish flame that burns perfectly without leaving any black soot on your cooking wares. Nexus gas cooker comes in silver colour and design in premium steel body with chrome finishing that will definitely add décor to your kitchen. Nexus Gas Cooker is styled with a tempered glass lid and glazed oven window in stainless steel that gives you longer use without rusting. The body finishing is easy to clean all you need do is wipe with a damp towel after use daily. It has control knobs that allows you to be in control of the heat temperature when you want to cook, bake and grill. It feature dish warmer at the bottom which makes it easy to warm your food. The compact design of the Nexus gas cooker will not take up much space in your kitchen but will definitely give you a stress-free feeling when making cooking variety of meals.